For dealing with dirty audio, Master Restoration Suite is one of the best solutions around, and you can get the plug-ins separately if you don´t need them all. The results are great. Clear interface. Each available separately. Excellent results. Great hum-removal plug-in. Monitor option. Price may deter some. Some inevitable artefacts at extreme settings. If you're even vaguely interested in polishing up old recordings or bringing vinyl back to life, you may be wondering where to start, as there are a fair few software options out there. The latest contender to pass our way is the Master Restoration Suite from Wave Arts. 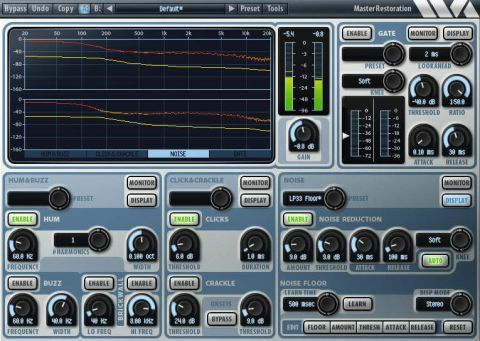 Designed to tackle the main elements of noisy audio - hiss, clicks and hum - all the processing elements are present in one plug-in called Master Restoration. You'll also find the same elements split into four compact units - MR Hum, MR Click, MR Noise and MR Gate - and these can be bought on their own too. Unlike some of the competition, all processors are plug-in only. However, with Mac (Universal Binary) and Windows support and DirectX, VST, RTAS, MAS and AU all covered, there shouldn't be too many complaints. Although gating and hum removal employ reasonably obvious processing techniques, by contrast, there's always a bit of mystery surrounding noise reduction and click removal. What's more, these processes can easily leave unpleasant artifacts all over your track if you push them too far. The most obvious giveaway that something's been lifted from vinyl are the clicks and pops. Wave Arts' MR Click processor divides this problem into two categories: crackle and click. The two seem quite similar, really only differentiated by the speed of the clicks - however, they're handled differently. In practice, the click option enables you to successfully reduce obvious clicks. Crackle uses a filter and can, if you're not careful, remove any sudden high-frequency sounds (they've included an 'onset bypass' function to alleviate this). The display gives you a heads-up on what's happening, and you can use the handy monitor option to hear exactly what's being removed. Reducing tape hiss and record surface noise can leave the sound completely lifeless. However, MR Noise does a very good job in this area (see boxout). It also includes an 11-point curve for fine-tuning the mapped noise profile parameters more accurately. Although MR Hum and MR Gate are the simpler plug-ins, they remain surprisingly useful, with Hum offering nine harmonic frequencies on top of the fundamental. It's surprising how far up the spectrum that hum can be heard, and this plug-in really nails it. Overall, this bundle is incredibly good fun to use, and the results speak for themselves. It isn't miraculous in what it does, and they've not opted for the built-in enhancer features that you'll see on some plug-ins, but we still remain highly impressed.